This series of 12 books covers basic doctrine every Christian should know. Practical illustrations accompany the interactive, easy-to-understand format. 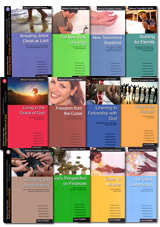 Daily Devotional The 12-book set gives a year’s worth of daily readings, including questions. Biblical Foundation Course Teach essential biblical foundations at your church. 48 teachings per set.